Twice a year, Paris experiences a magical month where every store boasts amazing sales on many of their goods. I’ve written about these sales before and to say that shopping was not an influencing factor in my decision to come in July would be a lie. When my amazing packing efforts sent me across the ocean with a half an empty suitcase, James had every reason to be concerned about my [normally very prudent] spending. More important than the empty suitcase, is the emptier closet back home. I say emptier because it is far from a gaping hole in there and might appear to some to still have a lot of clothes. But there are also a lot of empty hangers. This past year I started despising a lot of my wardrobe. I know that sounds really spoiled, but don’t pretend like you haven’t been there. You go to the closet, open it, and then stand there annoyed as nothing looks wearable. My friend Mary wrote a great post (even if it does praise my nemesis Madewell) about downsizing her wardrobe and identifying her style and I was inspired for a purge (because you know how I love those!). I brutally and callously purged my closet recently, removing anything that didn’t fit, hadn’t been worn in the past year, or was constantly fussed with when it was worn. The good news was that my closet feels so much more accessible now, so much less aggravating. The bad news is that I apparently hate all my summer clothes because the pickings for this season were mighty slim when the purge was over. I added a couple tops when it started getting warm, but I now have pretty strict shopping rules to avoid another closet purge anytime soon. Purchases must be loved instantly, involve no adjustment to my body (“this would look great if I could just lose 5 pounds”), no adjustment to my clothing (I’m looking at you Spankx! ), and most importantly, must match enough other things in my wardrobe to make it worth spending money. When I was in Kentucky in June, my mother astutely observed that these rules have turned me into a beast shopper who refuses pretty much everything. But now I am in Paris, where clothes are all miraculously awesome. Or not. I went shopping this week to make the most of the sales – faire les soldes – and my new rules knocked out everything I tried on. Fashion is at a rough point right now for women shaped like me, as that baggy shift look does unspeakable horrors to those of us with clubbing hips. I wanted to make exceptions because these unloveable clothes where Parisian unloved clothes, but that will just lead to a Parisian unloveable closet. I plan on stopping in on a couple other stores around the city throughout my stay, but for now, I have a new plan for shopping success and joy: Invest all time, money, and energy into buying baby clothes for the pregnant women in my life. This is the best of all possible worlds because none of these clothes have to go in my closet and they take up adorably little room in my suitcase. Paris Tip: As someone who takes hydration seriously, I spend a disproportionate amount of time stressing about where to find free and clean toilets in central Paris. The best go-to? The attractive, clean, and free restrooms that are on the top floor of all the big department stores. 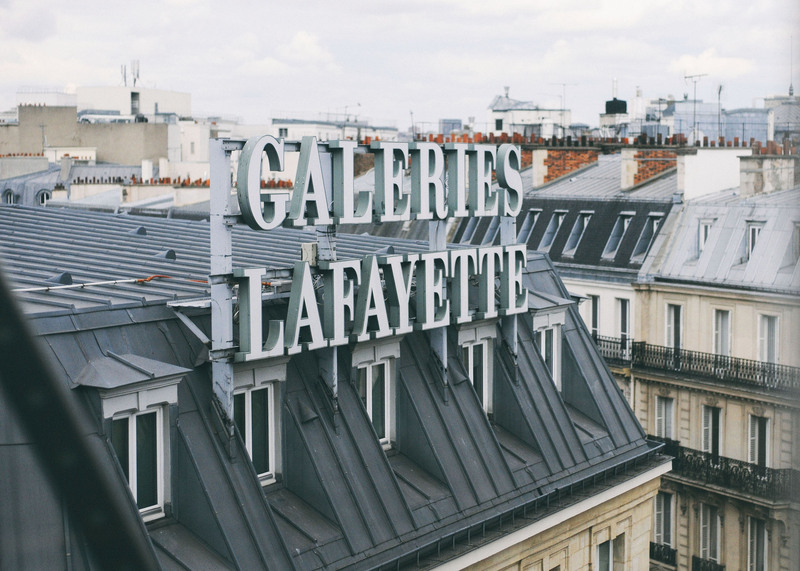 Plus, they usually sport great views of the city, like the picture above that has the Galleries Lafayette sign. 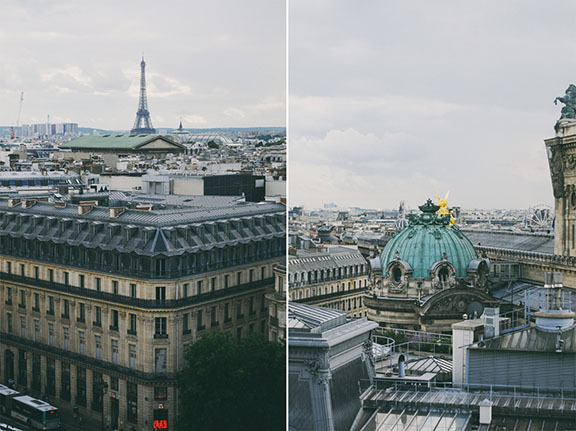 The other two shots from high up are also from Galleries Lafayette, but from the rooftop terrace that also offers free access. This great view of the city should not be confused with the toilet as that would be disgusting. This entry was posted in Uncategorized and tagged clothes, Paris. Bookmark the permalink. 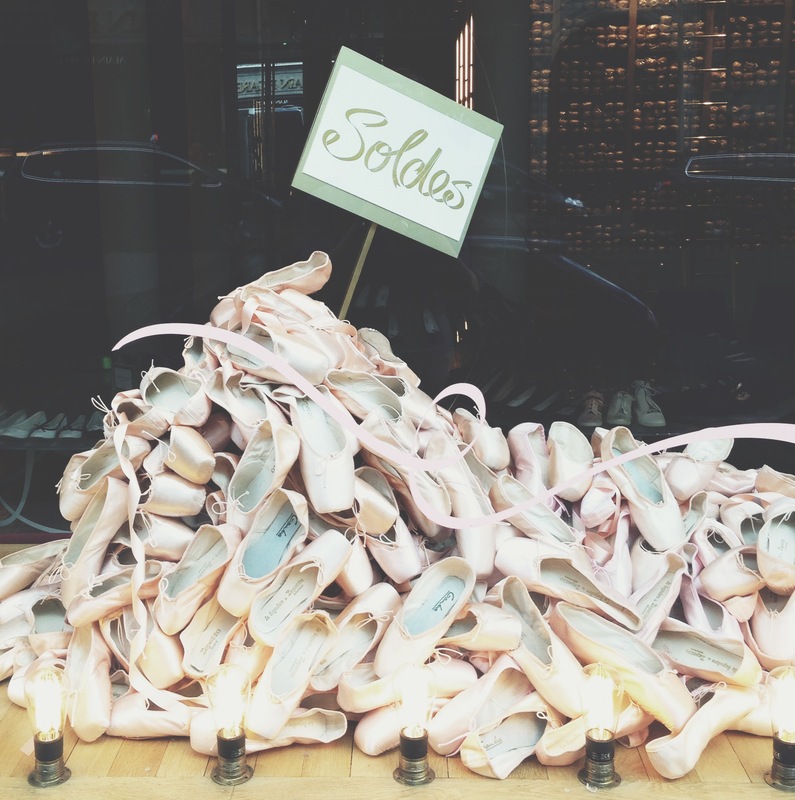 5 Responses to Les soldes. haha–that last paragraph reminds me of a (ever less) recent trip to Spain, where, while enjoying the wonders of European city life, I learned to appreciate two of America’s wonders: the free restroom and ever-present water fountains. Best wishes on your shopping endeavors! I thoroughly enjoy reading your blog. I happened upon it last week after reading your “my husband is not my soulmate” post, which was inspiring, and I thought was jammed-packed with so much truth. I may or may not have spent quite a bit of time reading through previous blog posts dating back to 2012. haha (I had some extra time on my hands this weekend). Your posts are great, simply because I can relate on so many levels. We have so many uncanny similarities from my inability to keep plants alive, Christian faith, grad school (MA-PhD) status, time spent in France studying (except in Nice, not Paris), love of everything French especially the cheese, and a boyfriend that has expressed his extreme dislike of instagram. Thank you for honestly sharing, the good and the bad. Hi- and welcome! I’m so glad you got a good blog binge in ; ). I loved Nice when I visited! Admittedly, it was in Feb, so maybe the worse time of the year to go, but the weather was still so much nicer than Paris and the color of the water was magical.